Only 10 Days Left to Register for Academy 2015 at the Discounted Rate! Want to Know the Average Industry Employee Turnover Rate? NPMA is conducting a quick survey to identify the turnover rate in the pest management industry. Click here to take a 3-question survey and we will send you the results and analysis this Friday in appreciation for your participation. The Professional Pest Management Alliance (PPMA), NPMA’s consumer outreach arm, is running a national advertising campaign for the next several weeks in some of the largest airport hubs across the country. 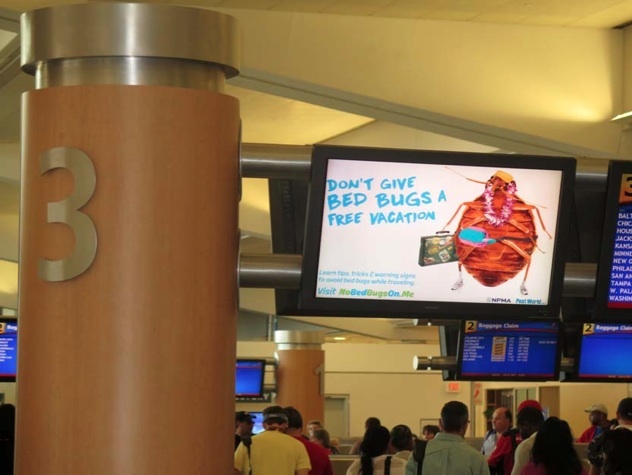 Two visually stunning ads - one focused on bed bug prevention in conjunction with Bed Bug Awareness Week and another on general pest control – can be seen in dioramas and digital displays at baggage claims, on flight status boards and in concourses around the country. Look for the displays as you travel in the following cities: Atlanta, New Orleans, Denver, Oakland, Orlando, Dallas/Fort Worth, San Jose, Chicago, and Philadelphia. Thank you to PPMA’s Guardians and Contributors for making this new way for the industry to speak to consumers possible for the industry. With the arrival of summer comes the resurgence of one of America’s most annoying and most dangerous pests—the mosquito. According to the Centers for Disease Control (CDC), there were 2,205 U.S. cases of West Nile virus in 2014, 97 of which were fatal. In honor of National Mosquito Control Awareness Week, taking place this June 21 – 27, 2015, NPMA urges Americans to be vigilant against threats posed by mosquitoes. Protecting employees’ health is the primary goal in any industry. OSHA CFR 29.1910.134 are mandated respiratory safety procedures protecting those producing and working in the pest industry. If your employees are exposed to respiratory hazards that may affect their health, you must provide them appropriate respiratory protection. This includes, but is not limited to, a written program, medical evaluations to assure they are healthy enough to wear a respirator, and finally initial and annual respirator fit testing and training. Spend some time learning what it takes to create a program and keep current. Register for this hour-long webinar to help you avoid audit penalty fees from OSHA. A massive collaboration between 58 scientists, led by Dr. David Kleijn of Wageningen University (Netherlands) recently published research investigating the role that wild bees play in pollinating crops around the world. The amount of value added by managed honey bees to the agricultural system is well-tracked and understood, but the same cannot be said for non-managed bee species which are often simply grouped together as ‘native pollinators’ or ‘other pollinators’. The authors of the study reported that a small number of common bee species, including the eastern bumble bee (Bombus impatiens), perform a significant amount of agriculturally-significant pollination from wild bee species. However, species populations can vary, as can other conditions, which makes preservation of other bee species of high importance. This paper was published in the most recent volume of Nature Communications under the title, "Delivery of crop pollination services is an insufficient argument for wild pollinator conservation". Beginning Sept. 14, the U.S. Department of Housing and Urban Development (HUD) will no longer use the map created by the U.S. Forest Service to determine the need for WDO inspections. In March 2015 HUD published Single Family Housing Policy Handbook (SF Handbook; HUD Handbook 4000.1), which identifies areas that are exempt from inspection. 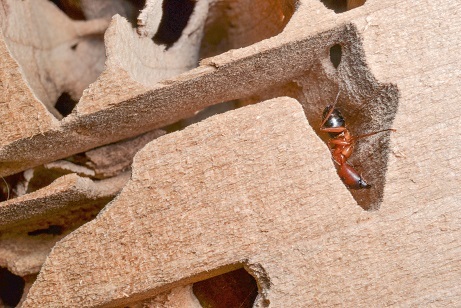 States that are not listed and have historically required termite inspection reports will still require termite inspection reports for all new construction. Click here to see the new exemption list. NPMA previously published this information in May detailing that the transition would occur on June 15, 2015, but HUD has recently extended the period to September 14, 2015 and also added more counties and states to the exemption list. On June 16, appropriations committees in both chambers passed bills that would block funding for the implementation of the EPA's Waters of the United States (WOTUS) rule. The fiscal year 2016 Interior and Environment Appropriations bills are now headed to their respective floors for consideration before lawmakers seek to bridge the gaps between the two. The appropriations measures are another attempt by Congressional Republicans to block the EPA WOTUS rule without having a veto proof majority. Both bills represent the broader fight between the White House and the Republican controlled Congress over government spending levels. Maine 10797 – 2015 – Certification and Licensing Changes (Comment Deadline 7/24/15): The proposal would 1.) Change the license period from two years to three; change the certification period from six years to three and align the licensing and certification periods. 2.) Amend the description of Category 6B to clarify what types of applications are included. 3.) Change the requirement for passing both the core and category exams within one year of each other to within five years. On June 5, the California Pest Control Board published three proposed rules in the California Regulatory Notice Register. All three rules would impact the structural pest control industry. A summary of each rule is below, followed by text of the full rule. All three proposed rules are open for comment. NPMA has been in contact with the Pest Control Operators of California (PCOC) who are actively engaged in these regulations. A family with a sick child were left stunned after seeing rats scuttling just yards away from the entrance to a children’s ward. Javerya Naz, 31, and husband Ahtsham Bhatti, 36, spotted three rats crawling out of a gutter as they sat at their daughter’s bedside at the Royal Oldham Hospital. The issue of pollinator health continues to be a hot topic in the media and the public. NPMA and PPMA have devoted vast resources to addressing this issue on a variety of fronts, particularly in the areas of public policy and public opinion. This year, as an extension of our commitment, we urge all NPMA members to take part in "Plant Your Own Pollinator Garden" NPMA National Community Day of Service on Aug. 22, 2015 (National Honey Bee Day). After Colorado Teen's Death From Plague, How Worried Should We Be About the Disease? Many NPMA member companies have been named in the 2015 PCT Top 100 list, an annual compilation of the leading pest management companies in the United States. Alan Caruba, former public relations professional for the New Jersey Pest Control Association and writer for Canada Free Press, passed away on June 15.